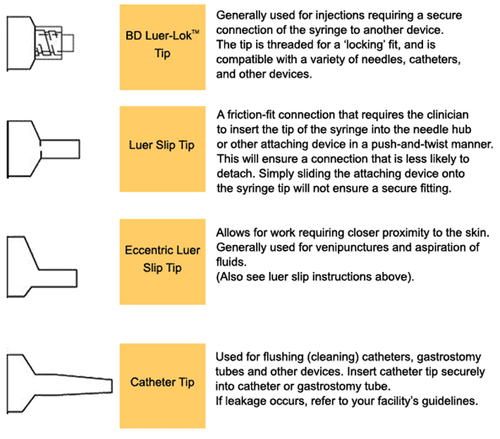 60 mL Irrigation Syringes by Becton Dickinson are available in three tip options: Luer Lok Tip, Luer Slip Tip, and Catheter Tip. 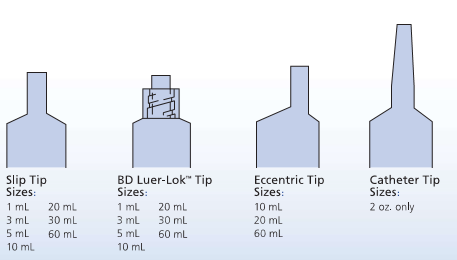 These BD 60 mL Syringes feature a clear barrel that allow better visualization of the dose contents. Bold graduation markings in 1 mL and in 1/4 ounces on the barrel of the 60 mL Syringes allow for more accurate measurements. 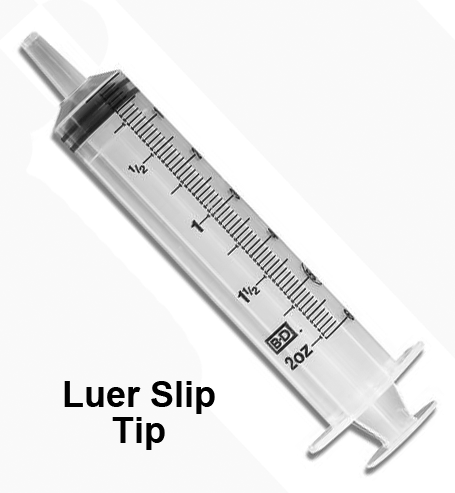 BD Syringes feature a tapered plunger rod for ease of aspiration, a positive plunger rod stop, and an added BD Luer-Lok thread for increased secure connection (Luer Lok Tip). Becton Dickinson 60 mL Syringes are latex free. Packaging is clearly labeled latex free. Three tip options to meet individual needs. Clear, bold graduation markings for accurate readings. Clear barrel for easier inspection. 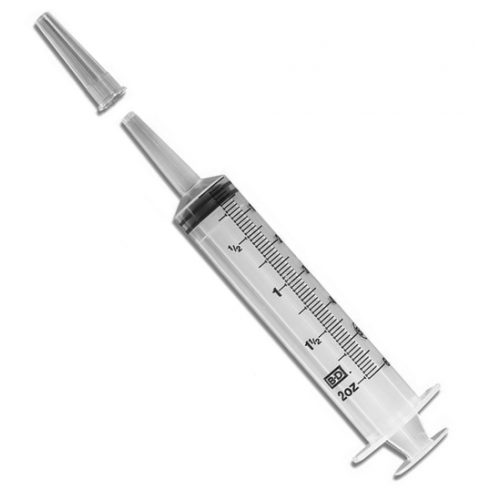 Syringe Capacity: 60 mL, 60 cc, 2 oz. 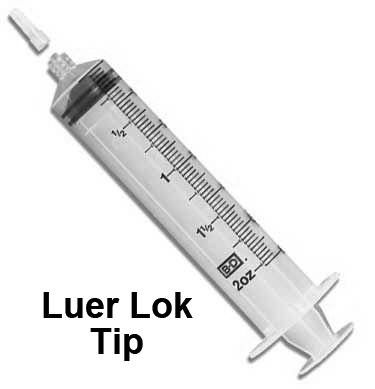 Tip Options: Luer Lok, Luer Slip Tip, Catheter Tip. Graduations: 1 mL and 1/4 oz. BD Becton Dickinson 60 mL Syringe for Irrigation Product Numbers: 309620, 309653, 309654. Could these be used for a retention enema? 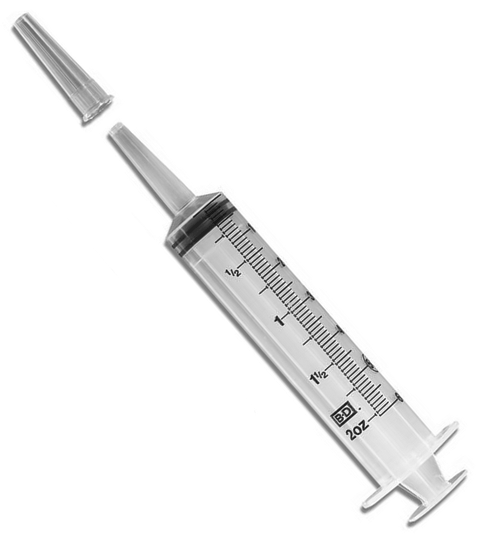 What are the dimensions of the syringe? 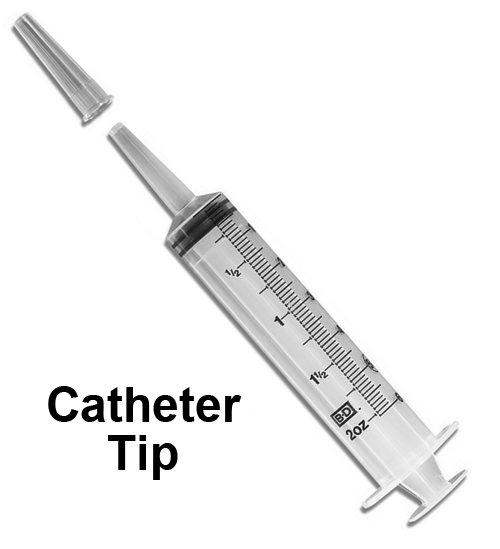 Dimensions are not available from the manufacturer; only the cc's the syringe can hold. Are these individually packaged in a sterile plastic sheath? This item is individually wrapped for sterility. 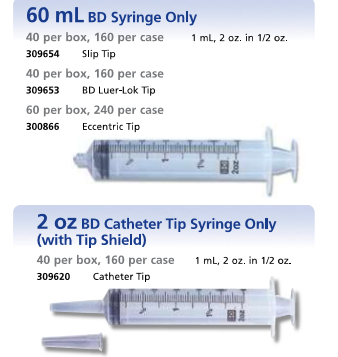 I've tried several 50 mm syringes and the BD are the best. They make a tight fit in my enteral tube port. They don't leak. Not overpriced for the hight quality. This was the best price I found for these syringes. I use these for my son's blenderized diet. Order was accurate and delivery was quick and as promised. Will use them again! Just what I wanted. I'll be bookmarking this for future orders. Thanks! My address is 8 Almendra Lane, Los Altos, CA. It is not Los Alpos. I asked twice to have the address to be corrected. This product is being used to clean tubes. This product has never failed. This product is very reliable.